Following the declaration of an outbreak of the Ebola Virus Disease (EVD), a haemorrhagic fever in the neighbouring Democratic Republic of Congo (DRC), the health ministry in Uganda has asked health workers to intensify their surveillance against the deadly disease. The acting director of Health Services Dr Henry Mwebesa on Monday issued a notice directing all district health officers in the country to be vigilant. Dr Mwebesa said that, so far, the ministry of health in DRC has confirmed the outbreak of EVD in Magina Health Zone of Mabalako in North Kivu about 100 kilometres from Uganda's border. 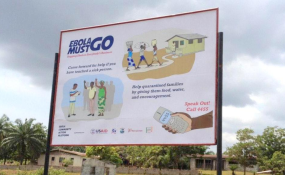 "The purpose of this communication is therefore to request you to enhance your surveillance systems and preparedness and have a high index of suspicion for Ebola, urgently report any aslerts to Public Health Emergency Operation Centre," Dr Mwebesa wrote. Dr Mwebesa said the surveillance is necessary because the affected areas in DRC are currently facing political turmoil thus causing movement of refugees to Uganda's neighbouring districts.